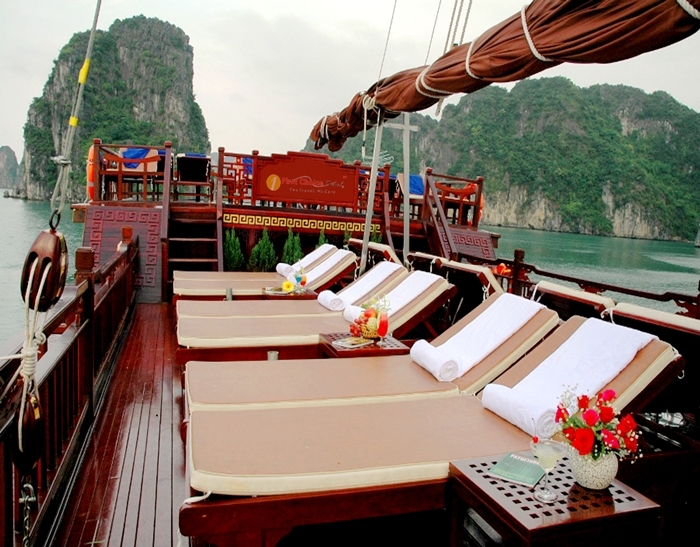 This traditional styled boat with a modern touch will further enrich your experience of Halong Bay. With 29 meter long; 6.9 meter wide of fine wood, Dragon Pearl Halong Junks boasts one of the most amazing cruise experience. 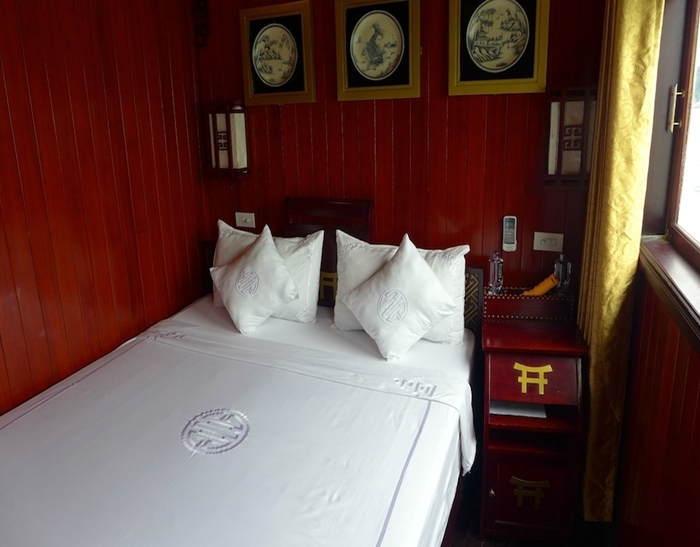 Dragon Pearl Halong Cruise has a total of 11 well appointed cabins, with fine woodwork cutting through the architecture and interior decoration. 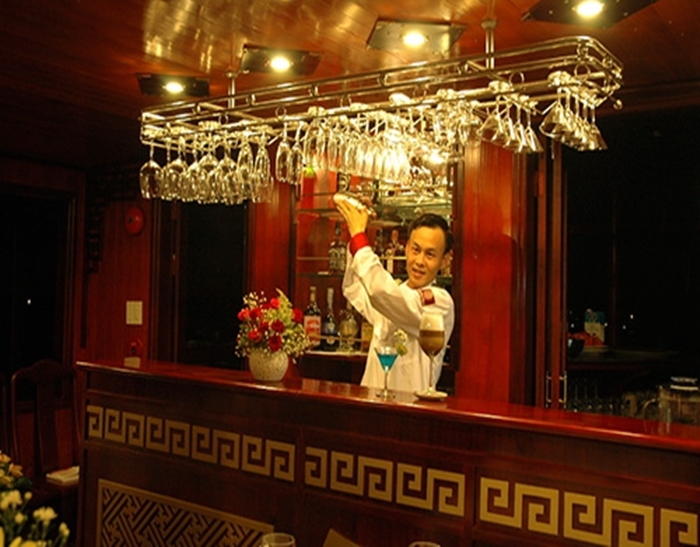 The cruise is fully equipped with a dining room and bar, promising fun while you are onboard. 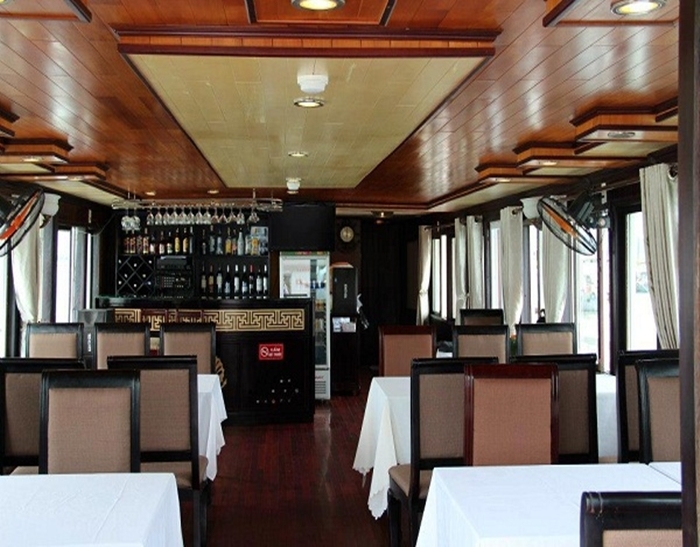 The common area can seat 36 and perfect for any cruiser looking forward to venturing out Halong Bay. The sundeck on top of the cruise is great for phototaking, sunset watching or simply resting. 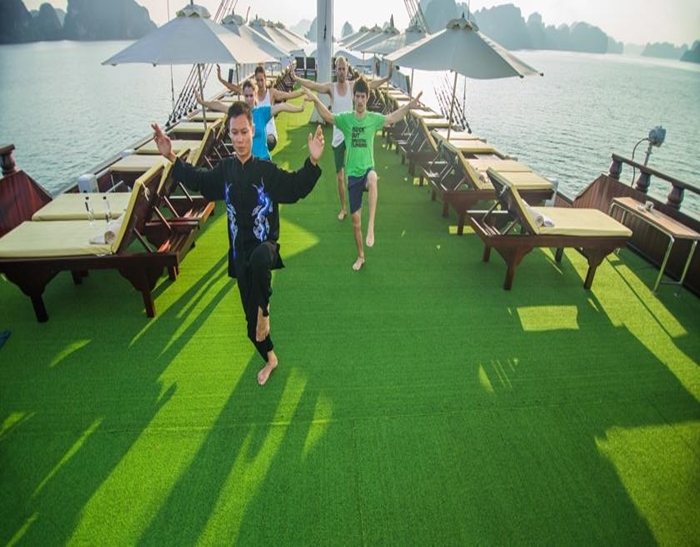 Enjoy the colors and images of the Bay with Dragon Pearl Halong cruise and you will not be disappointed in the least. 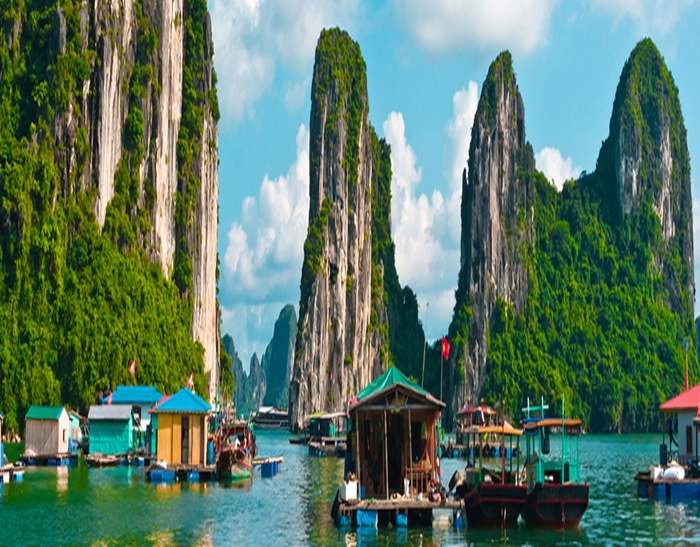 Book Dragon's Pearl Halong Bay Cruise and Halong tour directly through Vietnam Eco Travel to get the best rates, big promotions and discover a different world with our luxury Halong Bay Cruises and Halong Bay Tour. 11.30 – 14.30 : Back to junk for lunch and relaxing. 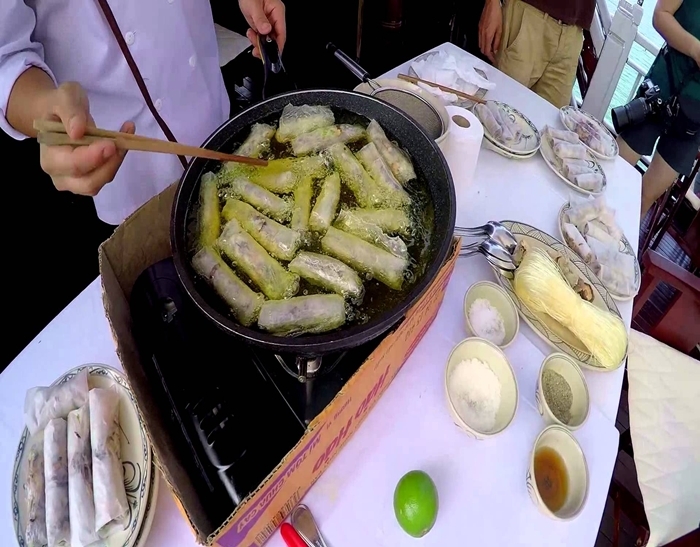 14.30 – 16.00 : Visit Cong Dam fishing village, meet the local people and pass through the lagoons. 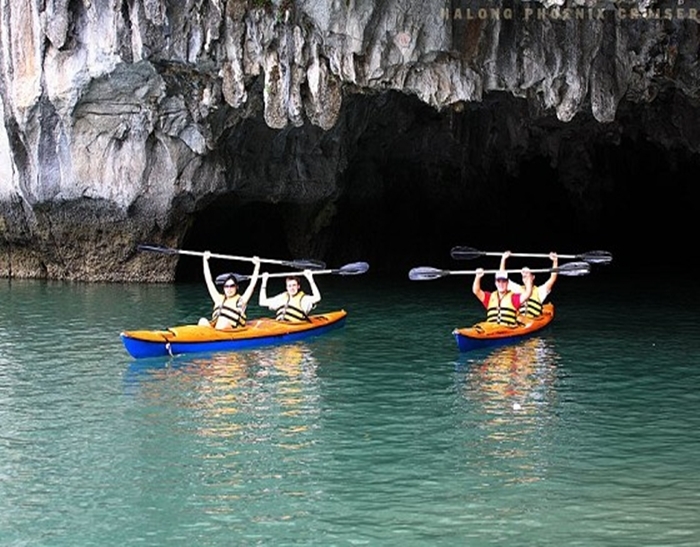 16.00 – 17.30 : Cruise back to Cong Do for swimming or kayaking. 19.00 – 21.00 : Have a Deluxe dinner in cave, overnight on board. 08.30 – 09.30 : Enjoy swimming & relaxing. For Private charter: Child from 4 years old: the same rate as adult. ** Surcharge of 25% will be added for cruises on December 24 & 31 and Lunar New Year Eve. 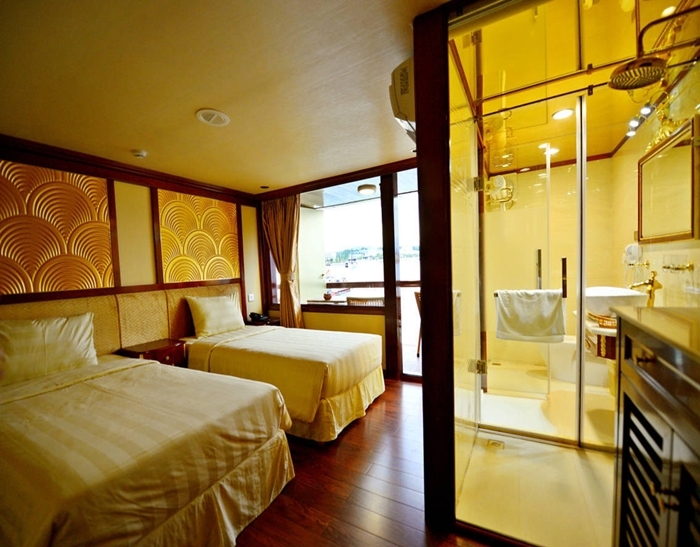 What do you think of Dragon's Pearl Halong Bay Cruise? I had a hunch when booking the Dragon Pearl 2 1-night cruise that this would be one of the most memorable travel experiences of my life. I was not wrong! The ship, food, service, good company and most of all the sublime scenery of this wonderful area was out of the world. The vessel is quite small and ideal for those who like a more informal experience. You quickly get to know your fellow 20 odd passengers - yet there is enough space to do your own thing. The traditional wooden structure is a delight on the eye and as Dragon Pearl Cruises have their own beach, you never feel in a crowd. The itinerary cleverly gets off the beaten track. I had two teenage kids with me and they enjoyed the kayaking, cave and beach as well as becoming expert scenery photographers, The highlight for my partner and i was getting up at 4.30 am to photograph the sun-rising over the stunning limestone karats - a memory I will never forget! Highly recommended. "Perfect Cruise of Halong Bay"
My recent cruise of Halong Bay was just what I had hoped for. The boat was beautiful with lovely cabins, common areas, and places to watch the scenery go by. There was a nice array of activities on my two night cruise, from kayaking, to swimming, to eating, to quietly enjoying the scenery. The cruise was well-paced and impeccably organized. 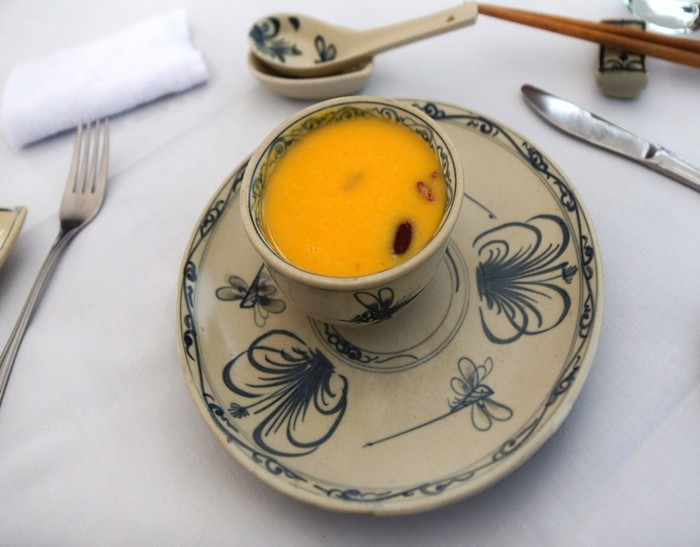 The food was always extravagant with many course meals and great variety of different seafood. I enjoyed the small group of people we sailed with and it felt friendly and comfortable. The crew was also very friendly and worked to meet our every need. Of course the scenery was amazing, and I certainly got my fill of outstanding karst scenery. I recommend this tour company--it was certainly a cut above how I usually travel, but by the end it was worth it, making my time in Halong everything I wanted it to be. 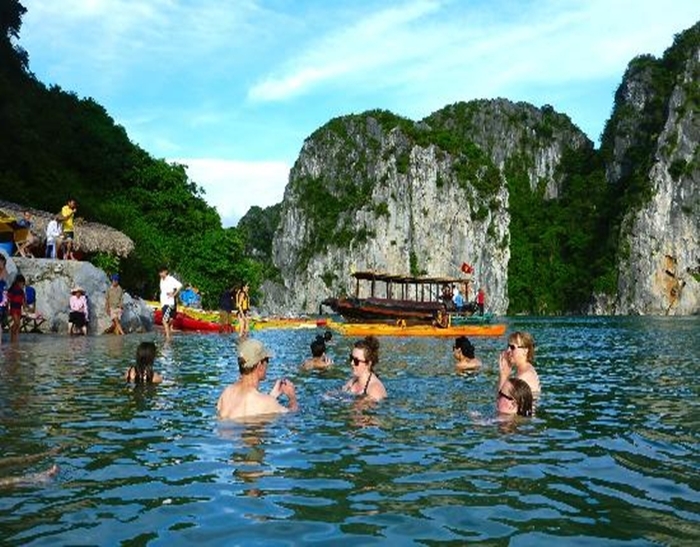 "Excellent excursion on Junk in Halong Bay"
"Excellent Tour top to bottom"